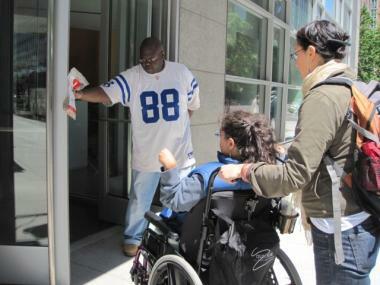 Without automatic doors at the Battery Park City library, Janielle Fermaint needs two people to help her get inside. BATTERY PARK CITY — Janielle Fermaint sat outside in the rain for nearly 20 minutes last week waiting to be let into the new Battery Park City library. Fermaint, 24, has cerebral palsy and uses a wheelchair to get around. She cannot push the library’s heavy doors open herself, so she has to wait for someone to respond to the buzzer outside. Those doors give the wheelchair-bound a sense of independence, she said. 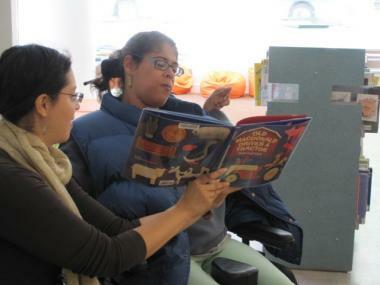 Janielle Fermaint reads a book inside the BPC Library with help from Cathy Valladares, of Job Path. The new $6.7 million library on North End Avenue just opened in March. Library officials say the buzzer system complies with the Americans with Disabilities Act, and they cannot swap the library’s current glass doors with automatic ones. The library inherited the doors from the Riverhouse condo building, which rises above the new branch, Pace said. The decision not to replace the doors was not related to the New York Public Library’s $37 million budget cut this year, Pace said. Fermaint goes to the library almost every day to read and to search for volunteer opportunities on the computer. An aide accompanies her, pushing her wheelchair and pressing the buzzer outside the library. But the aide cannot open the door and maneuver Fermaint inside at the same time. “It strips a level of independence for people who are already dependent in so many ways,” said Cathy Valladares, who accompanied Fermaint to the library this week. Valladares works for Job Path, an organization that helps people with developmental disabilities. A lack of automatic doors is a problem throughout the city, but it is particularly galling to see brand-new buildings open without them, Valladares said. After Fermaint and her mother raised the issue at Community Board 1’s BPC Committee earlier this month, the board agreed to take up the cause. Fermaint is confident that she will get automatic doors installed eventually. When she and her family first moved to Battery Park City 11 years ago, the World Financial Center didn’t have automatic doors either. “We fixed that,” Fermaint said with a smile.